CALLAHEAD provides same day delivery of our portable sanitation equipment at no extra charge. We have the most trucks in all of Brooklyn, Queens, Nassau, Suffolk, Staten Island, Bronx, Manhattan and Westchester every day so you know there will always be a truck near you. CALLAHEAD has the most trucks on the road, the most equipment in our yards and more employees to take care of you than any other portable sanitation company in New York. This allows us to provide quick service where others can't. Our same day delivery guarantees you like-new equipment from a professional uniformed driver on one of our brand new delivery trucks, within New York City, Long Island, and Wescthester, N.Y. So, even if you need your equipment the same day as ordered, you will always receive the best quality equipment in all of New York. Only CALLAHEAD has like-new portable sanitation equipment, sanitized and ready to be delivered same day as ordered at no extra charge. It is the CALLAHEAD philosophy that perfection does, in fact, exist. We have never stopped thriving towards perfection in everything we do. As with the development of our portable sanitation equipment ̶ that is as unique as we are ̶ and is built to operate perfectly. Having only a fleet of brand new, perfectly clean trucks on the road to deliver and service your equipment. Making sure all service and cleanings of our rentals are done perfectly every time. Implementing systems for our day to day operation, to ensure that we run as a perfectionist company. Since 1976, CALLAHEAD has never failed to follow through on our mission statement, "To Develop and Evolve a Human Necessity." It is something that we can confidently say that we have done, and continue to do perfectly. We're serious about sanitizing! When it comes to disinfecting our portable toilets, germs don't stand a chance. That's because our portable toilets undergo multiple cleaning passes, which culminate with sanitizing with a hospital grade disinfectant solution. According to the Center for Disease Control, "...in the past 20 or so years, resistant bacteria have become more and more common." We recognize the importance of reducing your exposure to viruses and bacteria when using a portable toilet, so we are serious about disinfection! The benefits of reduced exposure to viruses and bacteria cannot be overstated -- for workers, it means less chance for illness, and thus, more productivity. For special events, a cleaner portable toilet means more confidence in using it, which translates into a happier, more relaxed event! Why take a chance with another company? CALLAHEAD portable toilets are the most rented porta potties in all of New York for many reasons. We are the only company in New York that provides like-new high quality portable toilets. We have a guaranteed cleaning service with our trained service technicians that will clean your portable toilet perfectly every time, using only the best cleaning supplies and chemicals available. 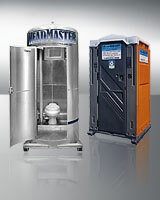 CALLAHEAD has the largest variety of portable toilets including more one-of-a-kind units you won't see anywhere else. We made a commitment to the portable sanitation industry to develop and evolve the industry, as we have continuously done since 1976. CALLAHEAD portable toilet rentals receive the most positive reviews of all other New York portable toilet companies combined. Whether you rent a portable toilet for a long-term job or a short term special event, CALLAHEAD is the only company in the industry that has the ability and dedication to provide like-new portable toilets, sanitary cleaning services, and have the resources to ensure your portable toilet is delivered and cleaned when scheduled, so you never have to worry! CALLAHEAD has more employees than any other portable toilet company in New York. We are proud to be the top employer in our field with many lifetime career employees. We fully train all of CALLAHEAD's employees so they may provide our customers with the best possible service. CALLAHEAD's account executives are trained specialists in assisting customers in selecting the best equipment and service for your job site or special event, so you never have to worry. Our fully uniformed delivery and service technicians go through a full training process with a senior technician prior to receiving their own route. This training process is to ensure all your rental equipment is serviced perfectly every time. Our inspection department follows up on each technician's route to guarantee your portable sanitation equipment is serviced as it should be. We have a dispatch department that assists all of our delivery and service technicians preparing daily their personal routes GPS's. The dispatch department is on call for each driver throughout the day so your equipment is always delivered, serviced and picked up as scheduled. Our yard staff works vigorously to detail your porta potty equipment, load and clean every flatbed and tank truck to get every rental in like new condition for our customers. We have an accounting department, mechanics, plumbers, website manager and additional office staff that help make CALLAHEAD a great New York corporation with job stability. CALLAHEAD has over 60 trucks on the road throughout New York with cleaning services and deliveries available 7 days a week. Our office is open Monday through Friday 7AM - 7PM and on Saturdays 9AM to 5 PM. We offer our employees fully paid medical benefits for themselves and their families which includes medical, dental and vision plans along with a 401K for their retirement. CALLAHEAD is honored to provide career opportunities to help enrich the lives of New York families, whether they reside in New York City, Westchester, or Long Island. 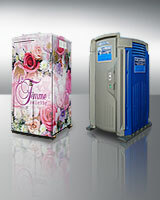 CALLAHEAD has more designs in portable toilets than any other company in our field. We can honestly say that we have the best looking portable toilets in the portable sanitation industry. CALLAHEAD has been creating original designs in portable toilets for nearly 4 decades. For example, our JOBSITE HEAD has the colors of orange and grey with our classic navy blue signage. We chose these colors because they are most commonly seen on construction sites such as the colors of bulldozers and concrete. The look of this particular portable toilet on the jobsite is extraordinary. The difference in our portable toilets at any location will give your site a sense of distinction and style which no other portable toilet company can provide. CALLAHEAD has the largest variety of uniquely styled portable toilets that will give your long-term rental or short-term special event distinction and exemplify your drive for excellence. The difference between the CALLAHEAD brand and brand X, (which is every other commodity-based portable toilet company), is that we deliver what we promise with every rental. We are the porta potty company that sets the standard which all others try to compare. However, none of them have the experience, creativity or resources to do so. Decades in the portable sanitation industry, CALLAHEAD has continued to invest in our porta potty equipment and services, so that we may provide you with the best sanitary equipment that is unavailable anywhere else. We know our clients are special and expect to get what they pay for; no other company can deliver like CALLAHEAD. We are a different kind of company, and the only one in our industry delivering quality equipment and guaranteed sanitary service, every time. CALLAHEAD has been servicing New Yorkers with the best portable sanitation equipment and service since 1976. Through our nearly four decades in business, we have invented more groundbreaking products for the portable sanitation industry than any other company. We have perfected our cleaning service so that our customers are assured the utmost sanitation, and cleanest equipment rentals they deserve. CALLAHEAD is renowned in the portable toilet industry and is the company that every construction worker and contractor wants at the job site. Don't settle for another company just because they give you a lower rental price. That lower price promises to provide you with lower quality equipment, unreliable, unsanitary or limited service and higher charges elsewhere or their business would go out of business. In the end, it will cost you more in time, money, stress and unhappy employees because their porta potty is regularly unclean, making it unhealthy. The fact is you cannot provide quality service on a regular basis if you don't have the financial resources to purchase hospital grade sanitary cleaning products, hire quality employees, purchase new vehicles that are cleaned and serviced daily and supply the highest quality equipment. We only want a clean portable toilet for ourselves, our employees, our family and our friends. We want to provide them with the best resources available because we care about their needs and their health. Going to the bathroom is one of the most personal things we all have to do. It is a necessity in all of our lives, and when using a public restroom we are at risk of being exposed to germs and bacteria that can cause illness. Shouldn't you consider the risks involved in renting from the cheapest company? If the trucks and tools they use to service your equipment are not cleaned daily and in like-new condition, how can they possibly clean your portable toilet? Common sense prevails when a customer stands back and looks at CALLAHEAD next to every other company in our field. CALLAHEAD has the newest and most advanced equipment, the cleanest and newest trucks in our field, uses only hospital grade sanitary products and all of our service technicians go through a rigorous training process. Our price may be a little higher, but our sanitary cleaning service and products are overwhelmingly superior. We are the only company that cleans our portable toilets with pride. We develop porta potties entirely with the user in mind and always consider, "What would we use?" and "What would we want our families to use?" It is this thought process that enables us to develop equipment and cleaning services that cannot be matched. We believe that you can never have too much service when it comes to a clean bathroom. CALLAHEAD's motto, "To Develop and Evolve a Human Necessity," has been our constant pursuit with all of our portable sanitation equipment and the development of our cleaning systems. We build, design and supply equipment for the portable sanitation industry that we use. You get more for your rental at CALLAHEAD than any other company can provide. Our nearly 40 years in business has made us experts in the industry which is why we always supply our customers with quality, through and through. All of New York's construction workers and contractors know that CALLAHEAD portable toilets are by far the best porta potties for their temporary portable toilet needs. CALLAHEAD not only delivers brand new equipment quickly and professionally, but all rentals come with the best cleaning service in the industry, that is guaranteed. It is common knowledge to all New Yorkers who rent portable toilets that the #1 choice is CALLAHEAD portable toilets. For nearly 40 years we have been providing construction jobsites with the largest variety in portable toilets with rentals, accommodating every budget without compromising on our great service. We are the only company in New York that has the experience and resources to provide long-term portable toilet rentals with guaranteed service that is thorough and always sanitary. Don't be fooled by the sales pitch of other companies. CALLAHEAD has the cleanest portable toilets and is the #1 porta potty rental in the field! In business since 1976, CALLAHEAD has developed more for the portable sanitation industry than any other company in New York. We have acquired vast knowledge from our decades servicing New York, making us the leader in quality porta potty equipment and superior cleaning service that cannot be matched. We have over 60 brand new trucks throughout New York delivering and servicing CALLAHEAD equipment by our trained uniformed professional technicians. We have more employees working to serve our customers needs than any other portable toilet company in the New York area, including Long Island and Westchester. Other companies claim to have the ability to match CALLAHEAD's equipment and service, but don't be fooled by imitations. We have systems in place that begin from the very first phone call to our office that carries through to the delivery and servicing of your equipment to the pickup of equipment at the end of your rental. These systems developed by CALLAHEAD have been perfected so that our customers are always confident in quality and superior service with every CALLAHEAD rental! 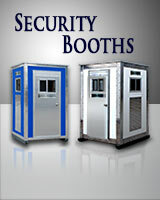 CALLAHEAD guard sheds are the most rented security guard booths throughout New York. Designed by CALLAHEAD our guard sheds are available in a variety of sizes. Whether you have one, two or several security guards, CALLAHEAD has a guard shed to suit all your security guard shed needs. Only CALLAHEAD guard sheds are made of durable fiberglass that is weather tight. All guard shed rentals come with heaters and can be installed with air conditioning for year round comfort. Every guard shed has windows, plenty of room for a table and chair/s, equipped with electrical outlets, interior lighting, doors that lock from the inside and out and skylights for natural light. CALLAHEAD guard sheds are also well ventilated. Security guards will appreciate the comfort you care enough to provide for their security too. Our guard sheds are by far the best in the field and available only exclusively from CALLAHEAD. We would like to welcome back those customers that may have left CALLAHEAD to try another portable sanitation company. Whether your reason for leaving us was due to a false sales pitch promising better equipment and service, lower price or an unpaid balance due to CALLAHEAD, we will always welcome your return. At CALLAHEAD we would never want egos or embarrassment to interfere with reestablishing a relationship of past CALLAHEAD customers, no matter what our history may hold. We realize the persuasive sales pitch of our competitors that promise to match CALLAHEAD's equipment and service all for a lower price can be tempting. We understand that you may make a change due to the illusion that you will save money. However, more customers come back to CALLAHEAD than any other in our industry. The fact is, they cannot match our equipment, service and highly trained staff to give you the quality equipment and service you pay for. Return customers also realize that those companies that promise to save you money cost you more in the end. Hitting you with hidden charges such as repairs, fuel, delivery and pick-up of equipment, unclean and unsanitary porta potty equipment, and just cannot provide you with the service you were promised and are paying for. CALLAHEAD has the ability and decades of experience to always provide you with the excellent service we promise. We have more employees and trucks in New York than any other portable sanitation company here to take care of you. Our equipment is of the highest quality with much of it being designed and created exclusively by CALLAHEAD. We have the newest trucks that are equipped with a GPS navigation system, serviced regularly and cleaned daily. Our service technicians are always in uniform and fully trained to clean and detail your porta potty equipment perfectly at every service. The cleaning supplies we use are of the highest sanitary level and the best available. CALLAHEAD is here ready to welcome you home to the quality and service you deserve and pay for that only we can provide! CALLAHEAD has been the leader in developing new and revolutionary equipment for the portable sanitation industry for over three decades. Our equipment sets the standard of which all others follow and desire to emulate. The most popular system competitors so desperately attempt to duplicate is the CALLAHEAD PORTABLE WATER AND SEWER SYSTEM. This groundbreaking system was invented back in 1986 for our PORCELAIN TOILET SYSTEM by Charles W. Howard, CALLAHEAD's President and CEO. Mr. Howard began his career in the portable toilet industry in 1976, building portable toilets from scratch. Since his inception into the business, he has been determined to develop his company's equipment and could foresee the imminent changes he could make to the portable sanitation industry. The PORTABLE WATER AND SEWER SYSTEM was designed to be used within the construction industry for job site office trailers. Mr. Howard's goal was to develop a system so that office trailers could have a bathroom toilet and sewer system just like the one in your home. Prior to Mr. Howard's invention, an office trailer's restroom was essentially a toilet seat over a box inside the bathroom of the trailer. As you could imagine, restroom use was unpleasant. The CALLAHEAD system has many benefits such as, choices in porcelain toilets, odorless operation and a winterization package to eliminate freeze-ups. In addition, our flushing system supplies over 50 pounds of water pressure, which is 10 pounds more pressure than the average home's bathroom. The CALLAHEAD PORTABLE WATER AND SEWER SYSTEM can move to any location the trailer needs to be, yet you feel as though you are using a bathroom in your home. CALLAHEAD is the creator of the PORTABLE WATER AND SEWER SYSTEM for office trailers. We are the only company in our industry to operate with the highest of standards. The systems we put into place make us the leader in the industry. The CALLAHEAD PORTABLE WATER AND SEWER SYSTEM is the perfect system for your office trailer. It will be the only system that you will ever want to use! Consistency is one of the most important elements of a company's success, a product's success and the success of any service. At CALLAHEAD we've learned that the best way to create consistency is to have a backup system for all of our systems. This is an extremely difficult task, however to be a great company, it must be done. A few examples of CALLAHEAD's backup systems are: For every 4 route drivers we have one extra driver; for every 4 trucks there is one extra truck; for every piece of equipment in the field we keep matching equipment in our yards; if we need 10 account executives, we would have 15; if we need 15 phone lines we would have 25 and so on. As you can see, to be a great company that believes in being perfect, it is very expensive, but is truly the only way to be the best. Multiplying the systems above and beyond the company's needs is critical to secure great service and equipment to the customer with the highest level of consistency. Therefore, a business must be as consistent as possible, especially to succeed in a company's inherit goal, which is to survive. Another element of great consistency in business is quality. Quality creates consistency and consistency creates quality. The higher quality will elevate the consistency but it must be quality thru and thru from the company's equipment and products to its people and operations. All employees should have the mindset of buy the best, be the best and sell the best. This mentality creates a consistency, which is pretty close to perfect. As with CALLAHEAD having thousands of pieces of equipment on the street (throughout NYC, Nassau and Suffolk counties on Long Island, and Westchester county, NY), we can end the business day regularly without one single complaint. Better Sanitation Equipment And Service Won't Cost You More — It Will Save You More! Hiring CALLAHEAD, the best in the industry, for all of your portable sanitation needs will not cost your company more money, it will save you more!. For example, say you have 10 employees and spend approximately $30K in labor costs. If you spend just a bit more for the best portable sanitation equipment for your employees, your company will be sure to reap the rewards. For starters, employees will know that you have hired the best portable toilets and sanitation equipment for them, which will greatly help company moral and boost energy. Employees would know you care about their personal needs and would reciprocate by working harder for your company, and present better quality work. Employees will, most importantly, have a healthier work environment when you supply them with the most sanitary equipment and service, helping to eliminate excessive sick leave from work. Your company will also represent much greater value having a CALLAHEAD on site over brand X, which are more commodity-based portable sanitation companies, that represent lesser value and greatness of your organization. Providing CALLAHEAD portable toilets and sanitation equipment for any jobsite or special event for employees, customers, patrons, clients or guests is guaranteed to reflect your higher value. It is unarguable that if you have a CALLAHEAD portable toilet on the jobsite or event, it will reflect positively on the appeal of your company or event to your employees, guests, as well as the public. It will give you, the customer, the ability to tell your employees, guests, clients, patrons etc., that you hired the best portable toilet company to serve their needs. Bringing this value will create a positive energy that you have provided them with the best portable toilet company in America, and the world! Whether your rental need is for a necessity at the construction jobsite, a formal event or movie shoot, CALLAHEAD portable restroom trailers are the best in New York. Our restroom trailers are fully mobile, yet operate and feel as if you are using a bathroom connected to a domestic water line. 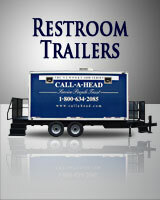 Additionally, all of CALLAHEAD portable restroom trailers have flushing toilets and full service sinks. Every restroom trailer rental from CALLAHEAD arrives standard with all the luxury amenities included, such as our Headliner toilet seat covers and Headmist air freshener. We have restroom trailers perfect for more formal affairs with faux mahogany, faux marble and beautiful vanity sinks. Many of our restroom trailers have separate men and women bathroom facilities. Both interiors have separate stalls with lockable doors. Flushing urinals with privacy dividers are available in the men’s restroom trailers. Handwashing sinks with hot and cold running water, air conditioner, thermostat heat and stereo system are standard with some of our restroom trailer rentals. We also have temporary restroom trailers that are solar powered and need no electrical connections to operate. Renting for Construction sites, emergency or disaster relief situations, weddings or corporate parties and events, CALLAHEAD's restroom trailers are the cleanest and highest quality bathroom trailers in New York, and will be sure to please! CALLAHEAD's premium portable toilets are by far the best in the portable sanitation industry. We provide equipment that is unavailable anywhere else in New York. Our premium portable toilets have the look and feel of using a bathroom inside your home, so users who are usually skeptical feel at ease. CALLAHEAD has developed more for the portable sanitation industry than any other company in New York. We have premium portable restrooms that are actually beautiful to look at while the interior operates as a full service bathroom with a flushing toilet and sink system plus so much more. Our premium portable toilets work as if it were a bathroom attached to a domestic water line even though it isn't. The fact is no other company can ever compare to CALLAHEAD's premium portable toilets. CALLAHEAD is renowned for supplying the most up-to-date equipment and products in the portable sanitation industry. New Yorkers recognize that CALLAHEAD has the best portable toilets, restroom trailers, portable sinks, porcelain toilet systems and guard sheds rentals available. They also know we have the most accessories available to accompany every piece of equipment, so they receive the optimum level of service for their rental. CALLAHEAD's accessories are always carefully selected by our team of experts who are out in the field listening to our customers. Our goal is to provide users on the job site or at a special event the same benefits provided in indoor restrooms. CALLAHEAD goes above and beyond to deliver the highest quality porta potty accessories for sanitary protection and convenience, so our customers always have a pleasant experience using our products. When it comes to sanitary protection and the need for portable handwashing capabilities, CALLAHEAD portable sinks are the most rented portable sinks in all of New York. 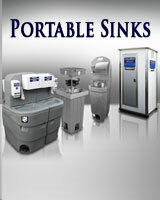 Portable handwashing sinks are a necessity at every job site or special event for a healthier environment. We have the largest variety of handwashing sinks, portable antiseptic dispensers, sink systems for office trailers and commercial grade utility sinks than any other company in New York. CALLAHEAD has portable sinks of every possible description, with no job too big or too small. Our hand washing sinks are perfect to be placed near our portable toilets, to encourage handwashing to workers and guests for everyone's protection. CALLAHEAD's heavy duty stainless steel commercial grade sinks easily handles the cleaning of dangerous solvents, such as cement and paint, off hands and tools at the jobsite. Our commercial grade sinks are also perfect for outdoor food venues for cleaning large utensils, heavy duty pots and pans and cleaning and preparing food. A Bosch Hot Water Heater is standard with our utility sinks so you will have hot and cold water at your fingertips. CALLAHEAD supplies hospital grade antibacterial soap that kills 99.9% of germs and bacteria including salmonella and E. coli with each sink rental. We also provide GoJo hand cleaner with our commercial grade utility sinks which cuts through grease and grime better than any other hand cleaner on the market today. Our portable sink rentals are guaranteed to give you the highest quality and sanitary protection you require and you will only receive when you rent from CALLAHEAD. All of CALLAHEAD's trucks are kept in pristine condition and are always purchased brand new. We service our trucks regularly and clean them daily so you will never have an old dirty truck coming to your delivery or service location. We have chosen silver and white to give a clean and shiny look, so our customers can see the cleanliness of our vehicles, and they are never embarrassed to have one of our trucks on their jobsite. Such as our fresh water delivery trucks, they have never had anything but fresh water inside them. Since we purchased these trucks brand new we can say that confidently. We have our trucks equipped with the most advanced GPS systems so that every delivery and service technician has their full routes downloaded every day to ensure timely deliveries and service of your equipment. We understand that the portable toilet you rent represents you. CALLAHEAD trucks are the cleanest and most reliable service trucks so you are guaranteed timely service and will never have a beat up old jalopy arriving on your jobsite. CALLAHEAD vehicles are just a part of what makes us the only perfectionist portable sanitation company in all of New York.